The blessings continue to fall on Velocity Track Club New York. 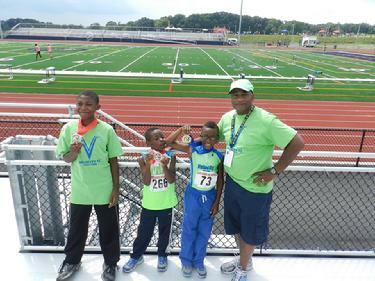 We traveled to Harrisburg, PA for the State Games of America Track & Field National Championships, which was held on Friday, August 2nd to Sunday, August 4th. Athletes from around the country converge at the brand new beautiful Bishop McDevitt High School Track Complex. This was the first track meet at this complex. It had a football and soccer field with the 400 meter track. Co-op City has some of the best track & field athletes in the country, four track team and community of children, adults and senior that needs a place to walk / run, like the Bishop McDevitt High School Track complex. With some of the best athletes in the country competing in the State Games of America Track Meet, the Velocity's athletes had to perform their personal best to be on the podium. Medals were given to the top 3 in their event and age group. We only had 6 athletes compete in the event and 3 out of 6 medals. Velocity won 5 medals in 5 individual events, 1 gold, 2 silver and 2 bronzes. The medals winners were: Julian Caldwell, Julian was the only 8 and under boy to run the 100 meters in 15 seconds to win the semi finals. Then he had to run the finals in the rain and he ran his 2nd best time to win the boys 8 & under 100 meter race, earning him his first National Gold Medal. Joseph Webster-Rutledge, just miss a medal in the 100 meter race with 4th place finish. But he was determined to earn a medal; Joseph ran his personal best in the 11 - 12 boys 200 meter race to earn a Silver medal. This was Joseph's first National Medal too. Then Dontae Lindo went 3 for 3. He competed in 1500 meter race on Friday and the 400 meter and 800 meter race on Saturday. Dontae took 2nd place in the 1500 meter race, 3rd in the 800 and 400 meter race. Dontae is use to competing on the national stage, he medal at the USATF In-door National Championship. All the athletes preformed well and we are proud of all of them. As we were traveling to Harrisburg PA, Giovanna Tolbert was in Michigan competing in the AAU National Championship. Giovanna performed well and finish 13th in the country in the 3000 meter run. Great job to all athletes.